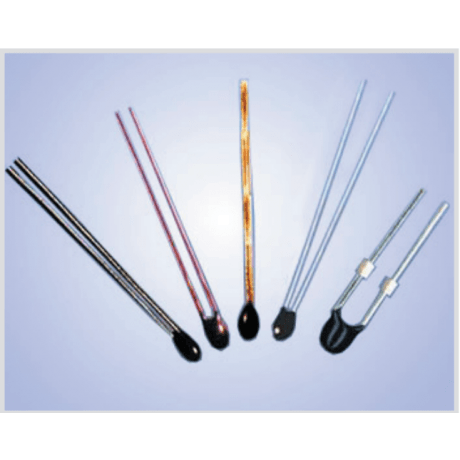 Pearl-Shaped Precision NTC Thermistor for Temperature Measurement The MF52 series of Pearl-Shaped NTC Thermistors is ethoxyline resin coated. The small size is made possible by new materials and manufacturing methods which provide the benefit of close tolerances and fast response. MF52 thermistors are available with 5 lead styles in standard or custom lengths. * B Value (25/50C) error is ±1% for components with rated resistance tolerance of ±1% and ±2% for all others. * The two ends of the lead wire cannot endure too big pull because of the small size and soldered spot in series of MF52. * Solder at least 5mm from the bottom of wire.